“They are decapitating the entire department,” said one department official, noting that the White House had given no cause for Alles’ removal. The instability extends to the Federal Emergency Management Agency FEMA, whose director, William “Brock” Long, left the DHS in February after supervising emergency and recovery efforts for several major natural disasters. Francis Cissna, the director of U.S. Citizenship and Immigration Services, and DHS General Counsel John Mitnick could be the next to go, DHS officials said Monday, speaking on the condition of anonymity to talk candidly of their frustrations with the White House. DHS officials are now looking for a way to satisfy the president’s demand for “tough” measures, including a plan called “binary choice” that would give migrant parents the option of remaining detained as a family or agreeing to a separation so that the child would not remain in immigration custody. Trump wanted the border closed two weeks ago but was dissuaded by Nielsen and Secretary of State Mike Pompeo, among others. 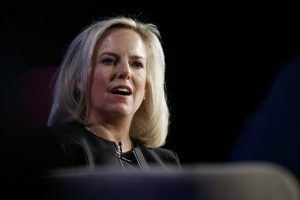 Nielsen has told confidantes that she felt uncomfortable with some of the president’s requests, particularly closing the border, and that the president did not understand many of the laws governing immigration. White House officials said last week’s security breach at the president’s Mar-a-Lago estate had nothing to do with Alles’ removal. In a memo to the Secret Service workforce Monday, Alles told staff reports that he’d been fired were incorrect. James Murray, a career member of the Secret Service, will take over as director beginning in May, White House spokesperson Sarah Sanders said in a statement.